E D Seabury, Rockville Centre, L.I. The E stands for Edwin D Seabury. A long time resident of Roosevelt/Rockville Centre, Long Island, he served as a trustee on the first RVC Village board after they incorporated in 1893. Later in 1899 he served as president. His obituary in the September 29, 1926 issue of the Brooklyn Daily Eagle also mentioned that he served three terms on the Roosevelt School Board, was president of the Roosevelt Board of Trade and founded the Roosevelt Methodist Episcopal Church. E D Seabury is listed in the Rockville Centre section of the 1892 Brooklyn City Directory as pianos. He’s also listed in the 1898 and 1900 Annual Report of Factory Inspections of the State of New York as piano supplies. The 1900 Report indicated that he had four employees. He also had a son, Edwin D Seabury, Jr. I can’t find any information that connects Edwin or Edwin, Jr., with a bottling business but the time period and location are correct. 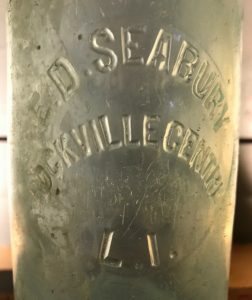 The bottle is 27 oz with a tooled blob that fits the late 1800’s time period that Seabury was active in Rockville Centre. I’ve found no mention of bottles from this business on the Internet and that’s unusual. Who knows??? I need to visit the Rockville Centre Historical Society.